Let’s just say it up front: tomato sauce shouldn’t be thick. I don’t know how many of you were raised in America in the 60’s and 70’s, but back then what we called “spaghetti sauce” was thick with tomato paste and dense with McCormick spices out of a packet. It wasn’t my mother’s fault. We weren’t of Italian descent, and food culture being what it was, that’s the way we ate it, in fact, gobbled it. As I’ve eaten now countless pasta dishes and pizzas, I continue to marvel at how unadorned, un-thick, and un-tampered-with a true, pure tomato sauce really should be. Emphasis on the “un”— it’s all about the tomato. I was reminded of this simple fact yet again last Friday when we went to eat at my (now) favorite restaurant in Milan, the Trattoria Milanese in Via Santa Marta. I don’t know what possessed me other than the fact that the place is a temple to the great comforts of Milanese and Italian cooking, but I ordered meatballs. And, in a moment of weakness, I asked for them to be accompanied by that other universally appreciated comfort food—no, not spaghetti; that’s an American combination—mashed potatoes, or as the creamy mass is called in Italian, puré (borrowed from the French) or purea di patate. 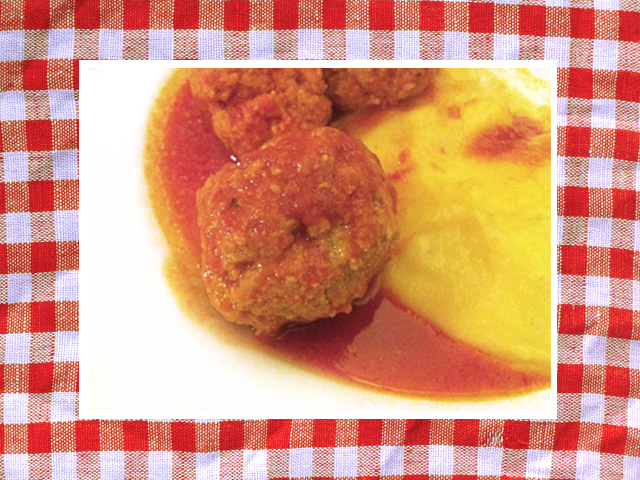 When my plate arrived, I laughed at the soul-foody simplicity of what sat and oozed on its surface: a buttery cream dominating the center, three simple veal meatballs, and an overlay of a surprisingly acqueous tomato sauce. I was delighted; this was going to be good. It exceeded my expectations—it was excellent. And the crowning glory was that insipid looking sauce, in reality bursting with tomato flavor and very little else. Ingredients for 4-5 people: (to use with pasta, gnocchi, rice, etc., or as a base sauce) a generous 2 pounds of fresh pear-shaped, or oblong tomatoes (about the length of your index finger or thumb), 50 grams of butter (I use olive oil), 1 stalk of celery, 1 carrot, 1/2 an onion, several leaves of basil, salt, pepper. 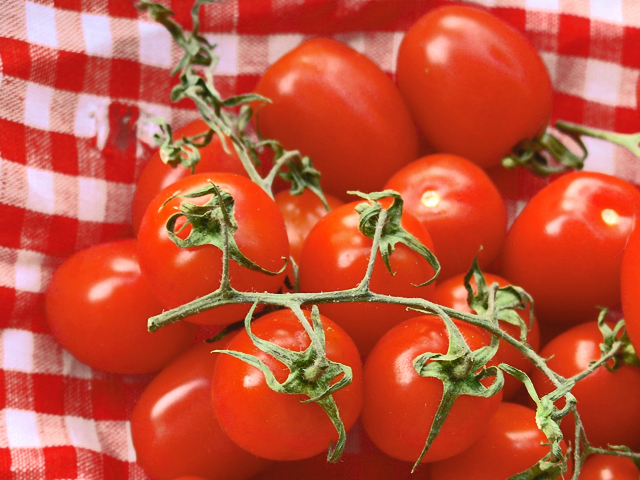 Process: Dunk the tomatoes quickly in boiling water, then remove, rinse in cold water and peel. Remove seeds. 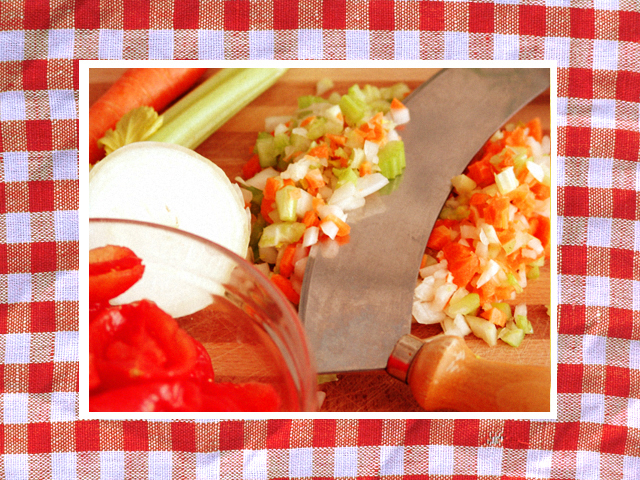 Sauté in the butter (or oil) the finally chopped celery, carrot and onion. Add the tomatoes together with basil, salt and pepper and let the mixture cook over medium heat for 35 minutes or so, stirring from time to time. 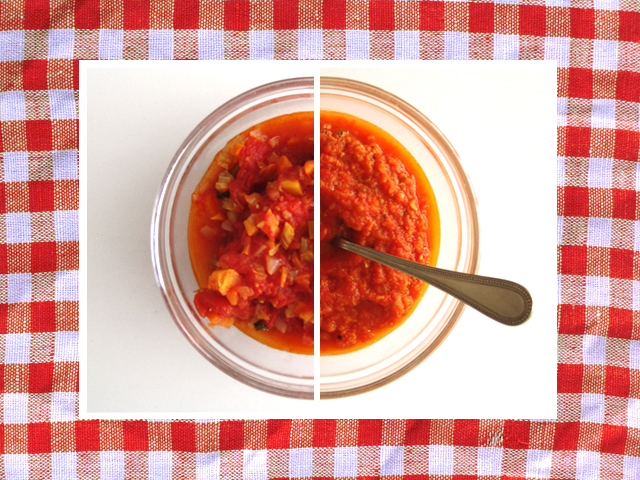 You can use the resulting sauce (below left) as is or, as is more commonly done here, passed through a manual food mill (below, right). Bon appetito. This entry was posted in ITALY, SAVORING and tagged mashed potatoes, puré di patate, purea di patate, salsa di pomodoro, tomato sauce, Trattoria Milanese. Bookmark the permalink. yum! even though the cold weather seems to be fading in our memories, i’ve been craving comfort food of the heavy, cold-weather sort. loaded with carbs. never tried substituting mashed ‘taters for pasta, but it looked GREAT, and very comfortable. we can’t wait to come to italy/france and learn us some mo’ cookin’ techniques. I can’t wait for you to come. Never butter in Salsa di Pomodoro. Butter is used in some parts of Northen Italy (basically Veneto), but the original recipe of salsa comes from Campania, where no one will ever use butter for the “pommarola”.